ComponentOne Studio introduces InputPanel for WPF, a container control designed to create powerful data input applications with minimal effort. The control is a new paradigm to create and maintain data forms that lets you easily view, add, edit, delete, and navigate through data records. 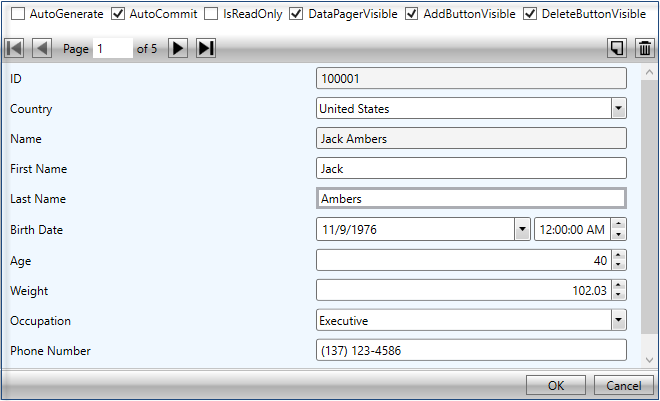 InputPanel can be easily bound to a model object, data table or a collection which automatically populates the UI with built-in editors and hence, there is no need to add any input components explicitly. These editors handle basic level validation for you, so you can handle the inconsistencies in user input with minimal development effort. Besides, the InputPanel control provides you the ability to customize its layout, design and appearance for easy and consistent styling.